Residents of Norway’s northernmost county of Finnmark are so angry over the terms of a looming and likely forced merger with neighbouring Troms that they’ve threatened everything from civil disobedience to secession in recent months. Now they’re in the process of voting on the merger in a referendum, with the state government unlikely to respect its results. Finnmarkinger, as Finnmark residents are called, started voting last week in a referendum that has continued into this week for reasons of practicality. The area is so vast, with many people living in remote areas, that local boats have been sailing with ballot boxes from place to place along the coast. Around 55,000 people are eligible to vote, and the issue is so controversial that most all want their say. Local political leadership thus wants to be sure everyone has an opportunity to cast ballots. He and other county leaders have asked for a meeting with Prime Minister Erna Solberg, who leads the Conservative party, after results are in. Her government has been pushing for municipal reform ever since it won power in 2013, with much of the looming changes coming in the form of mergers of both counties and communities in order to achieve greater economies of scale. Solberg and her ministers, including Monica Mæland who’s now in charge of local governments, think larger government entities can operate more efficiently, save taxpayers money and provide better welfare services in the future. The opposition Labour Party has until recently agreed, and Parliament has voted to greatly reduce the number of Norwegian counties including Troms and Finnmark. The reality of turning most all of Northern Norway into one county that will be larger than Denmark have since soured many, including local politicians who are members of Labour. That’s prompted national Labour politicians to re-think the issue as well, to great objections from the conservative government coalition that’s eager to enforce the Parliament’s decision. It’s all led to an unusual level of hostility, not least after a recent survey showed fully 86 percent of Finnmark opposing the merger with Troms. The survey, conducted by research firm Sentio for Norwegian Broadcasting (NRK), also showed that 73 percent of Troms residents oppose the merger, too, but not so greatly they’ve resorted to a referendum. Both sides have also been disagreeing on everything from where to base a merged county government’s administration to the name of the merged county. The biggest dispute, though, is over the numbers of representatives to a new merged county commission. 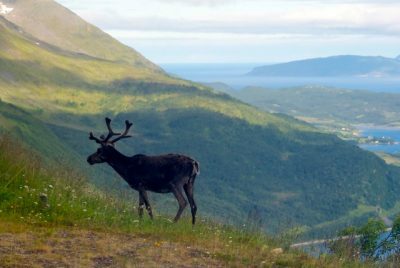 Troms, which has a bigger population than Finnmark, is slated to get two more delegates than Finnmark, which is objecting mightily. Mæland, the state government minister in charge, appears unwavering in her threats to all but ignore the referendum results, and even “punish” Finnmark residents if they don’t soon name new representatives to the merged county commission with Troms. “Finnmark is steering its own developments in this,” Mæland told NRK on Sunday. “If they continue to boycott appointing new representatives to a merged commission, we’ll set up one ourselves.” A compromise hammered out earlier between Finnmark and Troms gives Finnmark 17 representatives while Troms will have 19 because of its larger population. Finnmarkinger now want to dump the whole thing. Monday is the official election day, as the preliminary voting of the past week winds down. A result is expected before the 17th of May holiday on Thursday, which may be cause for more celebration in Finnmark and frustration in Oslo.